Indoor cycling, or Spinning, is a group exercise where participants ride a stationary bike to the rhythm of music under the direction of an instructor. It has been around for more then twenty years and continues to grow in awareness and popularity. Spinning is a low-impact, calorie-cannibalizing, indoor cycling experience. It's a "Cardio High" that clears your mind and heart and energizes you for the rest of your day. Riders report more energy, feeling great, improved cardiovascular health, loss of weight, increased strength and looking better. A rider can burn between 500-1000 calories in a single class. Will Spinning help me lose weight? Yes. 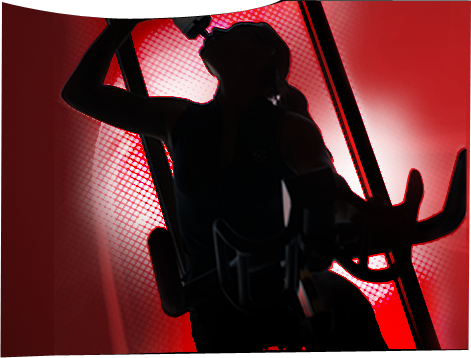 Spinning will help you shed pounds and lower your body fat if done regularly and in combination with a healthy diet. A rider can burn between 500-1000 calories in a single class. It is also a fantastic cardio exercise regiment leading to a more energized and healthier life. Will Spinning make my legs bigger? No. Indoor cycling will create definition, actually elongating leg muscles. What makes Revolution Indoor Cycling Studio special? Revolution Indoor Cycling Studio offers a warm, relaxed, safe team-like environment. Our instructors have been carefully chosen for their quality and their love of the sport. Check our SCHEDULE for the class most convenient for you. Then sign up online to RESERVE your ride or call the studio. If you are new to indoor cycling, please arrive 15 minutes early so we can show you the "set-up" and the "basics". The resistance knob on each bike allows you to control the pedal speed. Start slowly and as you get more comfortable with technique, the challenge is in changing speed, resistance, and intensity. The typical class consists of a 60-minute ride with cooling down and stretching. Some classes are 75 minutes and include some light weights in order to work your core and upper body. See our list of classes for full descriptions and class length. Available classes are listed and bikes can be reserved online by clicking HERE . You can also call into the studio to reserve a bike. Walk-ins are accommodated on a first-come, first-served basis. Cancellations must be made at least 12 hours prior to the class or the class will be deducted from your account. If I have an injury from another sport, is indoor cycling a good alternative? Because there is little to no impact to your joints while Spinning, it may be an excellent way to cross-train and avoid further injury. Only your doctor can determine if the cycling program is a safe option for you. What type of gear is needed to participate? Comfortable workout attire is all that is needed to get started. However, cycling-specific gear can make the class even better. Clip-in bike shoes give the rider more leverage and power. A heart rate monitor will also help maximize and measure every workout. A water bottle should be brought to class. We do have towels available for all our riders to use, but we don't guarantee that one will always be available. 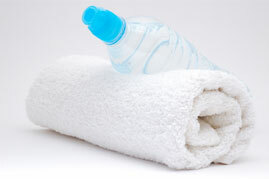 We offer bottled water for purchase. It's always a good idea to drink plenty of water during your workout. What are the height/weight requirements to ride the Spinner bike? Riders must be at least 4' 10", and under 350 pounds. What are the age requirements to take a class? Riders must be at least 14 years old for all classes. Does the studio have showers? Do you have changing rooms and lockers? We do have two changing rooms and one bathroom for you to change in. We do not have lockers, but we do have cubicles within the Spinning room for you to store your belongings in. All items must be stored in the cubicles. Only towels and water are allowed on or near the Spinner bikes. Do I have to be in great shape to take a class? No, anyone can benefit from Spinning. Because you control the resistance of your bike, you go at your own pace. A beginner can take a class right alongside an expert. It's a great way to get fit.